Illuminating Statistical Analysis Using Scenarios and Simulations presents the basic concepts of statistics and statistical inference using the dual mechanisms of scenarios and simulations. This approach helps readers develop key intuitions and deep understandings of statistical analysis. Scenario-specific sampling simulations depict the results that would be obtained by a very large number of individuals investigating the same scenario, each with their own evidence, while graphical depictions of the simulation results present clear and direct pathways to intuitive methods for statistical inference. These intuitive methods can then be easily linked to traditional formulaic methods, and the author does not simply explain the linkages, but rather provides demonstrations throughout for a broad range of statistical phenomena. In addition, induction and deduction are repeatedly interwoven, which fosters a natural "need to know basis" for ordering the topic coverage. Examining computer simulation results is central to the discussion and provides an illustrative way to (re)discover the properties of sample statistics, the role of chance, and to (re)invent corresponding principles of statistical inference. In addition, the simulation results foreshadow the various mathematical formulas that underlie statistical analysis. 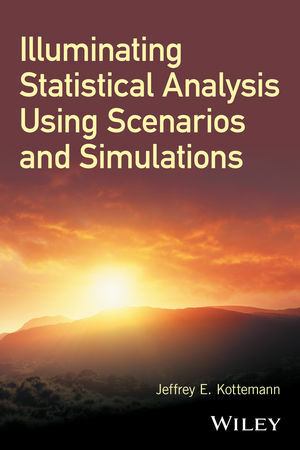 Illuminating Statistical Analysis Using Scenarios and Simulations is an ideal textbook for courses, seminars, and workshops in statistics and statistical inference and is appropriate for self-study as well. The book also serves as a thought-provoking treatise for researchers, scientists, managers, technicians, and others with a keen interest in statistical analysis. Jeffrey E. Kottemann, Ph.D., is Professor in the Perdue School at Salisbury University. Dr. Kottemann has published articles in a wide variety of academic research journals in the fields of business administration, computer science, decision sciences, economics, engineering, information systems, psychology, and public administration. He received his Ph.D. in Systems and Quantitative Methods from the University of Arizona.